Dishonorable Devin Nunes: What Are His Loyalties? 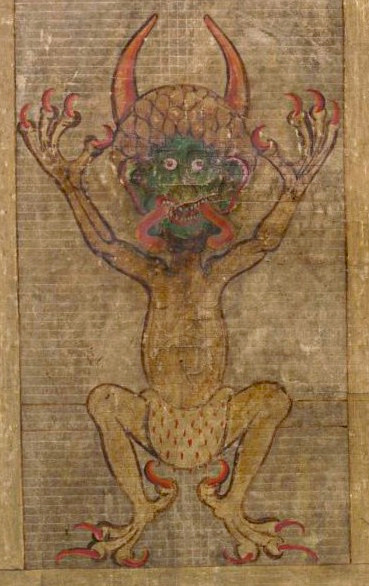 Illustration of the Devil in the Codex Gigas, folio 270 recto, early 13th century, by Herman the Recluse of the Benedictine monastery of Podlažice. To what Is Devil Nunes loyal? First, Devin Nunes himself, followed – possibly closely – by his family. Second, Trump, followed – possibly closely – by the Republican Party in its present grotesquely deformed version. Third, possibly the United States, possibly including the district that he supposedly represents. Given that order of priorities, it is not fitting that Nunes should be a member of the House Intelligence Committee, much less that he should chair it. Nunes was in Trump’s transition team. Yet he claims that there is no conflict of interest for him to lead the investigation of contacts between Trump’s campaign and Russia. The conflict of interest is clear. Nunes cannot be objective about this issue. In attempting to deflect attention away from the real danger – Putin’s mafia – Devin Nunes betrayed his country. He doesn’t belong in Congress. For his future, his best career option is to apply to become a caddy at one of Trump’s golf courses.